Anyone who has known me since at least College will tell you that if there is one vice that I have its that I love Wendy’s. This however wasn’t always the case. If you asked me in high school where my allegiance lied in terms of Fast-Food it was Burger King. I remember being able to roll up to the Drive Thru Junior year and being able to say “I’ll have the Usual Please” and that would cover not only my order, but also Chris Boylan’s order, and Mike Mingone’s order. Not many people are able to do that. Anyway while working at Freehold Funcoland during 2000-2001 I was turned on to Wendy’s by a co-worker. After that I ate Wendy’s for a solid year. Shortly after that Dave Thomas died. While chomping away a cheese burger one night with Shane in honor of Dave Thomas, I stared at the Flag, which was at half mast, and contemplated my own mortality and more importantly what made Dave Thomas the man he was to us all. 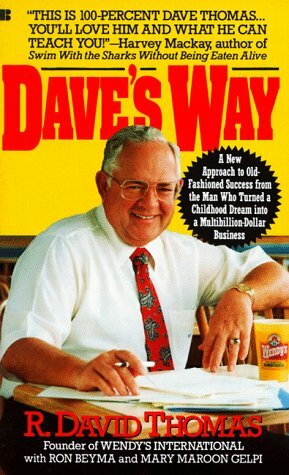 I learned shortly there after that Dave Thomas wrote an autobiography and I quickly tracked it down online for 49 cents and thus my journey into Dave Thomas’ world began. ding ding sean, its anecdotes. have you been to the new wendy’s on 70 and whitesville. it’s high-class. No I haven’t. Maybe you can take me out on a date there? If you do I bet I’ll at least let you get to third base with me. What’s third base in regards to guy-on-guy action? I’m confused. Your guess is as good as mine. I’ve never gotten to third base with a guy. I think it’s probably a good ball grab or something. Let me know when you two figure it out.